The building industry in Canada recognizes the advantages of steel buildings over the structures built using bricks and wood. Steel is easily adaptable and provides the architects or designers the freedom to attain a variety of architectural designs and durability. Canadian cities have iconic high rise steel houses, such as shopping malls, multi-storey non-residential buildings, single storey industrial buildings, and sports stadia. In the past 15 years, the market share of steel use has risen by approximately 70% for multi-storey buildings commercial buildings and 90 percent for single-storey industrial constructions worldwide. Fires can never lead to the total collapse of a steel-framed building. Research findings indicate that steel-framed buildings will still stand even after an intensive super fire of up to 1,500-1,700 F (800-900 C). An experiment by the British Steel and the Building Research Establishment in the 1990s shows that steel buildings, even when the secondary steel beams in a storey steel building remains unprotected, can still stand after a fire hundreds of degrees hot. The players in the Canadian real estate sector in Canada will have reason to celebrate steel buildings after hearing that high-rise fires including the One Meridian Plaza fire in PA in 1991, which lasted for 18 hours through 8 out of 38 floors, did not lead to the collapse of the steel building. In 1988, a fire outbreak at the First Interstate Bank Building in Los Angeles for 31/2 hours did no damage to the steel structures. Steel-framed houses have a high vibration resistance. Steel beams will provide an advantage in constructions that have frequent vibrations. In hospitals operating theaters and manufacturing industries where vibrations are quite common, stiffened steel frames and walls can prevent and structural damage to buildings. Steel-framed houses complete with steel walls and floors can never shrink. Steel piles and beams extracted from a water-clogged area for over 100 years will still be good for reuse. Unlike wood or bricks that can never be fit for recycling, steel is elastic and strong, making your house highly resistant to accidental damage. If your steel house receives any damage, you can easily repair the steel material by cutting, bolting, painting, or welding to restore the beauty of your steel structure. 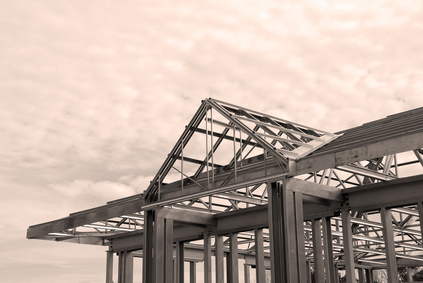 Your steelwork building will withstand high winds and other adverse weather conditions including winter too. The popularity of steel as a sustainable building material arises from the ease at which contractors can recycle steel several times without ever compromising quality. For homeowners in Canada with old steel structures that call for extensions, renovations, modernization, adaptations, or reconfiguring your steel home contractor will redesign the building without a harmful demolition and at an affordable cost.